Here’s an issue on which liberals and conservatives agree: policing the mentally ill. The two sides may have arrived at that position through different underlying beliefs, but they got there. Here’s a problem: In Texas, a conservative legislature passed, and a conservative governor just signed, the Sandra Bland Act, a law that sets a high, national bar for policies and procedures in mental health and criminal justice, and progressives haven’t yet noticed just how much this bill advances their cause. In fact, they’re complaining. That’s not a surprise. Progressives (especially in the Northeast and California) often look down on Texas. It’s not that Texas doesn’t sometimes deserve it. A few recent bills in the state legislature rode one stop too far on the crazy train, using conservative language to describe laws that would have vastly expanded government in the service of dodgy goals. But on the whole, the laws that Texas passes laws on police reform, limited government, and open records are remarkable and serve as models for “progressive states” like California, whose open-records and police-transparency laws are vastly inferior. Conservative Texans support law and order, and their expectations are high. This support is deep, so when a cop goes bad, Texans are not forgiving. Brian T. Encinia, the Texas state trooper who was so unnecessarily rude to Sandra Bland, over so little, and who later lied about the encounter in which he arrested her, was told exactly why his performance was unacceptable, charged with perjury, and then unceremoniously sacked. That wasn’t because the media were watching. It was because that’s how Texas troopers roll. Bland’s death in a Waller County jail cell, three days after her arrest, was ruled to have been a suicide. Yet nationally, in nearly every debate about policing, activists raise Sandra Bland’s case to demonstrate just how untenable the system is. Regardless of why or how she was arrested, Bland was incarcerated for three days in conditions wholly inappropriate for her detention. I believe she would be alive today had someone brought her for a psychiatric evaluation after Bland told them, as she was admitted to the jail, that she had recently attempted suicide. That’s part of what the Sandra Bland Act, signed by Governor Abbott this month, does. It requires managers in jails to determine whether inmates suffer from mental illness, and it diverts those who do to a mental-health facility. The law goes further: It also calls for all Texas peace officers to undergo every two years training in de-escalation, crisis intervention, and means of evaluating whether they are dealing with someone with mental illness. This will ensure that officers have the tools to divert people to treatment before they’re arrested. Finally, the law calls for steps to ensure that jail cells are properly inspected and requires that all jail deaths be investigated independently. That sounds like a lot of regulation and government — why should conservatives be happy? Because if it is done right, the law will result in less police involvement in situations with the mentally ill, and fewer mentally ill people will get caught up in the criminal-justice system. This will save taxpayers money. The National Alliance on Mental Illness reckons that jailing a mentally ill person can be three times more expensive than hospitalization. But — and it’s not often we get to say this — that’s not even the best part. We don’t need more crises. Cops are not trained, capable, or intended to treat the mentally ill. When cops are allowed to identify and divert the mentally ill, two things happen that are both terrific. First, the individuals will get the care they need, freeing the cops to work on situations involving criminals. The cops deal with a lot of mentally ill people, and we’re really not that good at it — not that we should be. Since we’re not trained to deal with it at all, judging us on how often we fail is kind of unfair. Still, society keeps asking us to handle what we’re not really prepared to handle.In the book In Context: Understanding Police Killings of Unarmed Civilians (2016), my coauthors and I report that, in 2015, 46 percent of the deaths of unarmed civilians after a police encounter involved someone suffering from serious mental illness, overdosing on drugs, or both. That’s a lot of damage caused by trying to force the square peg of the mentally ill into the round hole of the criminal-justice system. Second, the scale of the hidden cost Texans have paid for the police to deal with mental illness will be exposed. Every administration since Kennedy has cut funding to mental-illness programs. That was possible because the police were essentially handed an unfunded mandate to move from being society’s last response to mental illness and become instead its first line of defense. That neatly hid the cost from the public and gave politicians a handy scapegoat: It’s the cops’ fault! In Texas, that ends now. The rubber will meet the road when the sheriff shows up with a vanload of people and the mental-health clinics have no beds. This has clear national implications. After five decades of playing games, our nation’s governors, legislators, county managers, and other elected officials are going to have to face up to how little they have done for the mentally ill — and how much it costs to care for them. It’s going to get worse before it gets better. But get better it will. The irony is that, as the name implies, these require a crisis before they can be started. We don’t need more crises. Cops are not trained, capable, or intended to treat the mentally ill (and I’d wager that few mentally ill would select, given a choice, a cop to care for them). 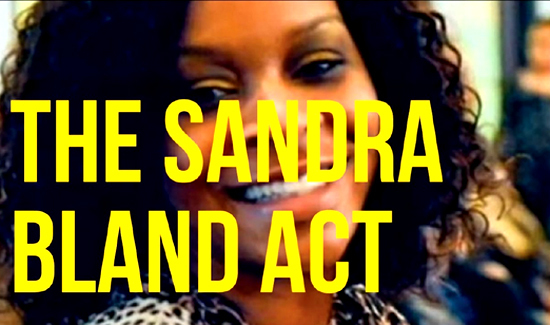 I believe Sandra Bland would be alive today if these rules were in place after her arrest. And she, the police, the jail, the community, and the taxpayers would have been better for it. Nick Selby is a Dallas-area police detective and the author of the forthcoming book Cyber Attack Survival Manual: From Identity Theft to the Digital Apocalypse and Everything in Between.